For the earlier turbojet, see Rolls-Royce RB.44 Tay. Originally designated 610-8, all but one training engine have now been converted to 611-8 standard. The newest variant is the 611-8C, which has cast HP1 turbine blades, larger fan from the 650-15, structural by-pass duct and FADEC. All Tay engines use a 22-blade titanium fan, a 3-stage intermediate-pressure compressor coupled to the fan shaft, a 12-stage high-pressure compressor, a 2-stage high-pressure turbine and a 3-stage low-pressure turbine. Thrust: 13,850 lbf (62 kN) Aircraft: Tay 611 entered service in 1987 on the Gulfstream IV/IV-SP, for which it is the exclusive powerplant. Rolls-Royce Tay on a Fokker 100, with thrust reverser engaged. The 620-15 is internally identical to the 611-8 and externally similar to the 650-15. Thrust: 15,100 lbf (67 kN) Aircraft: Originally designed to re-engine the BAC One-Eleven (650-14, only two made; both have since been converted to 650-15 standard. 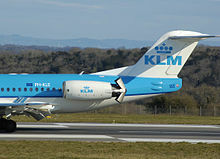 ), the 650-15 entered service on the Fokker 100 in 1989. The 651-54 is internally identical to the 650-15. The externals and gearbox suit the Boeing 727. Thrust: 15,400 lbf (69 kN) Aircraft: Boeing 727-100 from 1992. Conversion from three JT8D-7 to three Tay 651-54 was carried out by the now defunct Dee Howard Aircraft Maintenance Company in San Antonio, Texas, for the United Parcel Service, but all aircraft are currently grounded. Only one private 727 was converted. Data from Rolls-Royce and FAA TCDS. Wikimedia Commons has media related to Rolls-Royce Tay.